Football - Brighouse Old Boys v Crossleys. Gary Binns clears with a header for Old Boys. Sowerby Bridge and Ryburn United are setting the pace in the Premier Division after making it two wins out of two on Friday. Bridge followed up their opening success over Greetland with a 5-1 win at Northowram, inflicting the heaviest home defeat on the Rams for some considerable time. James Bunn kept out Damian Watkins’ shot in the first minute but was beaten by the stocky strider two minutes later. The visitors mixed physicality with some neat football and the only scare for Bridge against the slope in the first half was an Archie Griffiths header against the bar. Three minutes before half-time an excellent reaction save from Bunn, after a deflection, resulted in a corner. The ball bounced through a crowd of players to the unmarked Joel Cleary for a simple finish. Alex Wood increased the lead on 50 minutes, with the hosts appealing in vain for a foul on fullback Chris Dunne. Wood scored the fourth after 65 minutes and side-footed against the foot of the post from Watkins’ neat chip. Lewis Oldridge curled in a free kick home three minutes from time for the Rams but Bridge had the last word through Luke McGuire. Ryburn beat Midgley in their opener and then claimed the scalp of champions Illingworth St Mary’s by 3-1 at Trinity Academy with Tom Hiley, Adam Powell and Bradley Tynan scoring for the visitors and Tom McGregor for Saints. Hebden Royd Red Star got their season up and running in spectacular style with a 10-1 home win over Sowerby United. Lewis Cockroft and James Speechley put them two goals up but Liam Senior replied and the visitors’ three man midfield was threatening to get on top. However, Speechley got an all-important goal before half time and when Tom Garland headed home a corner straight after the break the visitors’ resistance melted away. Tom Barclay scored three goals in quick succession and George Oliver and Danny Lumb were among the other scorers. Greetland were also successful at the second attempt, registering a 2-1 home win over Calder ‘76, who created little. The hosts took the lead after 25 minutes. Rick Davison made a great save but was beaten by Jack Dighton’s header from the subsequent corner. Calder had a short decent spell but Greetland doubled five minutes before the break when experienced striker Karl Jowett, a threat throughout, was brought down by Davison and Chris Green scored from the spot. The visitors were better after the break. The home keeper had few alarms but was beaten by Simon Reekie after 70 minutes, following good work down the right by Steve Jones. Promoted Shelf made it four points from two games with an 8-2 success away to Shelf United with the help of four goals from Callum Lewis and two from tricky winger Alex O’Keefe. Brighouse Sports and Illingworth St Mary’s Reserves are setting the pace in Division One, with two wins out of two. Sports’ second win was by 6-3 at home to AFC Crossley’s while Saints won by the odd goal in seven away to Copley United. 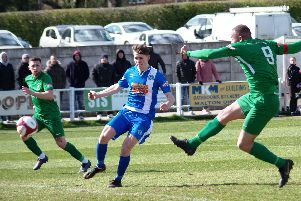 Seventeen-year-old striker Josh Robinson scored his second hat-trick of the season, open the scoring for Brighouse after taking the ball wide, past the defence. Robinson helped set up the next for midfielder Nathan Shaw and Gary Binns made it 3-0 from close range before Crossleys got one back before half time. Robinson broke away to make it 4-1. Crossley’s got their second and bagged another after Max Heaton had made a fine overlapping run from full back and finished with a nice, curling shot. Robinson appropriately had the final word. Salem got off the mark with a 3-2 win over Calder ’76 Reserves, helped by a strong first half showing. Calder were first to show, with Gav Martin finding space, but Liam Huson scored against the run of play and Iain King doubled Salem’s lead. Calder sent on Ben Fairburn, who got them back in the game with a superbly struck 30-yard free kick into the corner of the net. However, King showed good strength to hold off a tackler and make it 3-1 before Fairburn rode three challengers and scored Calder’s second approaching the final 10 minutes. In Division Two, Sowerby Bridge Reserves have six points in the bank after converting a 3-0 lead into a 4-2 home win away to Hebden Royd Red Star Reserves, for whom home team player-manager Chris Garbutt was a scorer. Stainland United could be the team to beat among the newcomers in Division Three after adding Warley Rangers to earlier victims Flying Dutchman. (B.Tynan T.Hiley A.Powell); Northowram 1 (L.Oldridge) Sowerby Bridge 5 (L.Wood 2 D.Watkins J.Hiley L.Maguire); Shelf United 2 (O.Coates H.Talbot) Shelf FC 8 (A.O’Keefe 2 C.Lewis 4 B.Ireland A.Hawker). Division Two: AFC Crossleys Res 1 (A.Burke) Junction Inn 4 (D.McCleod 2 T.Gorringe A.White). Saturday - Division One: Brighouse Sports 6 (J.Robinson 3 N.Shaw M.Heaton G.Binns), AFC Crossleys 3; Calder 76 Res 2 (B.Fairburn 2) Salem 3 (I.King 2 L.Huson); Copley United 3 (N.Sloane G.Ash M.Priestley) Illingworth St Marys Res 4 (B.Naylor 3 R.Ford); Ryburn United Res 4 (J.Brown J.Tait R.Redhead N.Hargreaves), Elland Allstars 3 (M.Kelsey 3); The Ivy House FC 3 (J.Brown 2 I.Nichol) Holmfield AFC 2. Division Two: Hebden Royd Red Star Res 2 Sowerby Bridge Res 4, Northowram Res 3 (M Eade 3) Shelf United Res 6 (B.Grogan 3 R.Broadley 2 J.Norcliffe). Division Three: Flying Dutchman 4 (M.Redman 3 R.Seekins) FC Ovenden 1 (C.Payne); Mixenden United 4 Shelf FC Res 2, Stainland United 7 (J.Brewster 2 D.Hodgson J.Pinchin G.Bainbridge T.Haigh T.Brook) Warley Rangers 1.